More advanced channel reordering can also be done with cv::mixChannels. \(X\), \(Y\) and \(Z\) cover the whole value range (in case of floating-point images, \(Z\) may exceed 1). If \(H<0\) then \(H \leftarrow H+360\) . On output \(0 \leq V \leq 1\), \(0 \leq S \leq 1\), \(0 \leq H \leq 360\) . If \(H<0\) then \(H \leftarrow H+360\) . On output \(0 \leq L \leq 1\), \(0 \leq S \leq 1\), \(0 \leq H \leq 360\) . This outputs \(0 \leq L \leq 100\), \(-134 \leq u \leq 220\), \(-140 \leq v \leq 122\) . Note that when converting integer Luv images to RGB the intermediate X, Y and Z values are truncated to \( [0, 2] \) range to fit white point limitations. It may lead to incorrect representation of colors with odd XYZ values. 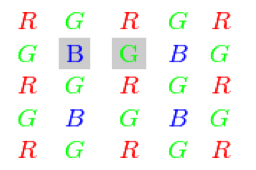 The output RGB components of a pixel are interpolated from 1, 2, or 4 neighbors of the pixel having the same color. There are several modifications of the above pattern that can be achieved by shifting the pattern one pixel left and/or one pixel up. The two letters \(C_1\) and \(C_2\) in the conversion constants CV_Bayer \(C_1 C_2\) 2BGR and CV_Bayer \(C_1 C_2\) 2RGB indicate the particular pattern type. These are components from the second row, second and third columns, respectively. For example, the above pattern has a very popular "BG" type.